"Maynard G. Krebs, paging Maynard G. Krebs. There's a Mai Tai at the bar with your name on it." 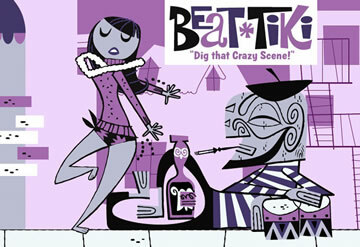 Alas, Maynard and his buddy Dobie Gillis are gone, but for the short-lived beatnik culture he lampooned, the beat goes on Aug. 14-17 at the 14th annual Tiki Oasis celebration in San Diego. That's because this year's theme is 'Beat Tiki,' combining California's premier celebration of tiki culture with the 'cool, daddio' perspective of the Beat Generation. In addition to its usual art show, car show, marketplace, and parade of Polynesian-tinged entertainment, this year's Tiki Oasis will feature poetry readings, a pop-up bookstore hosted by San Francisco's Beat Museum, and myriad mixology seminars in the spirit of the Beats. "We actually have doubled the amount of symposiums this year—everything from mixology, mid-century architecture, tiki/Polynesian pop, pin-up hair and makeup, tiki crafts and more," said Baby Doe Stroheim, who is co-producer of the annual Oasis with husband Otto, publisher of Tiki News. "We are especially proud to have original Disney animator Rolly Crump and the original architect of the Hanalei Hotel, John Mock," Baby Doe said, naming two symposium leaders. And then there's the people-watching ops in a scene that promises barefoot bohemians and spontaneous poetry readings. "I highly suggest sitting poolside and enjoying the cavalcade of color with an accent on Vintage Hawaiiana," Baby Doe recommended. "One of the most enjoyable experiences at Tiki Oasis is people watching." That is, no doubt, part of the appeal for the thousands of tiki enthusiasts who descend on the Crowne Plaza Mission Valley hotel each summer for this event. For more information or tickets to 'Beat Tiki,' click here.